Well I guess that’s that for my Guppy trade! The Fib levels finally gave way as the pair dropped like a hot potato early this morning. Actually, from the very get go, this trade didn’t go the way I had planned. I was hoping that price would find support at the 38.2% Fib level/ 136.00 major psychological handle, but as you can see, that didn’t happen. Nevertheless, as the trade wore on and edged lower, I didn’t lose confidence since it continued to show a lot of respect for the Fib levels. For a moment yesterday, it seemed like things were finally gonna go my way when risk appetite improved on news of Osama bin Laden’s death. Price was seriously testing the 136.00 handle and looked like it was gearing up for a break out. Sadly, that breakout wasn’t meant to be! It seems risk sentiment has already reversed and turned sour again. I wouldn’t be surprised to learn if concerns about a retaliation from the al Qaeda had something to do with this. Anyway, as a result, GBP/JPY came tumbling down, crushing my trade and stopping me out! But hey, that’s just the way the forex world works. One day you’re doin’ alright, the next, some groundbreaking news hits and you find your trade in the dust. But I ain’t gonna lose sleep over this. I believe the trade was technically sound, and had fundamental backing up until yesterday’s game-changer. In any case, I’m not gonna let this stop me from making more pips this week. The hunt continues, fellas! With the markets reacting positively to the U.K. GDP report, pound pairs soared up the charts, forcing GBP/JPY to bust out of that double bottom formation I pointed out earlier this week. However, the pair retraced, giving me a sweet opportunity to buy. After topping out at around 137.00, GBP/JPY fell all the way back to the 136.00 handle midway through the London session yesterday. Poppin’ on the Fib tool, I saw that this lined up with the 38.2% Fib level, as well as the previous week high. 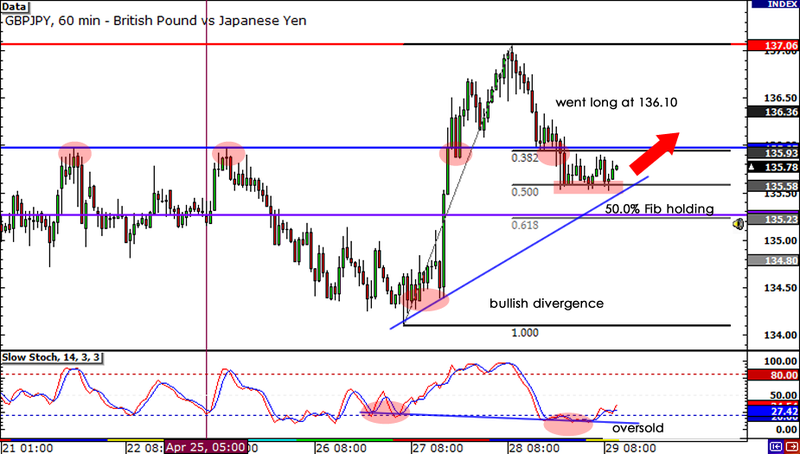 Bullish divergence was also forming, with price registering higher lows and Stochastic showing lower lows. I decided to buy at market when I saw price stalling above 136.00. I went with a 100-pip stop, putting my stop loss just past the 61.8% Fib. Right now, I’m aiming for the 138.00 handle, but if I see a more bullish sentiment on the pound, I may consider holding on a little longer. Fundamentally, I think risk sentiment is still up and the only reason why we saw a pullback yesterday was due to some profit taking ahead of the end of April. I wouldn’t be surprised to see risk-taking take place early next week as traders reposition themselves. Long at 136.10, stop loss at 135.10, profit target at 138.00. 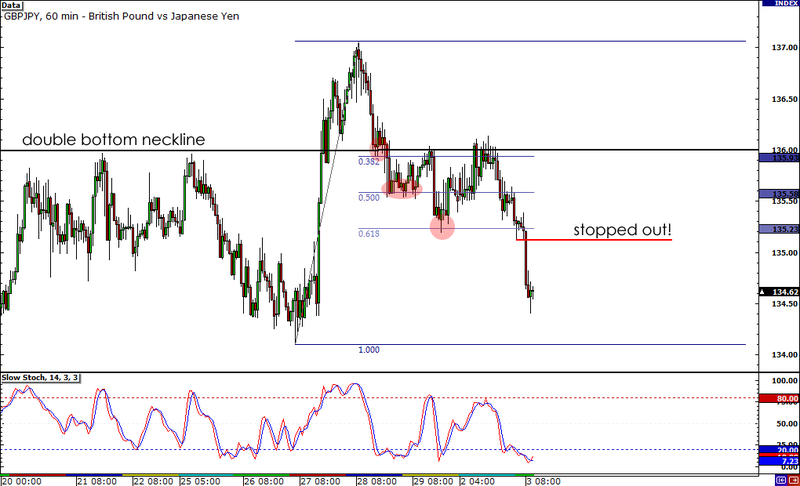 Currently, GBP/JPY is below my entry price, but I’m still feeling confident as the 50.0% Fib is holding nicely. Hopefully, this pair kicks it up a notch next week and blows past the 137.00 mark. If it doesn’t and I get stopped out, then no worries, as I’d only lose 1%. That’s all for now fellas, good luck trading today. Btw, congrats to Cam Newton for being the #1 pick in today’s NFL draft. Just like trading, it takes a lot of hard work to make it to the top of the draft, so props to you Mr. Newton!